Ken and I both grew up here in Louisiana (I was born here) and we've spent a good amount of our teenage years in the swamps. We have many great memories of taking our little power boat through the Honey Island Swamp and picking a wooded area to camp for the night. While the scenery of the swamp is totally different than the Caribbean that we now dream of, it is also beautiful! The huge cypress trees, the wildlife and the many unique houseboats and camps along the way are something to be seen. 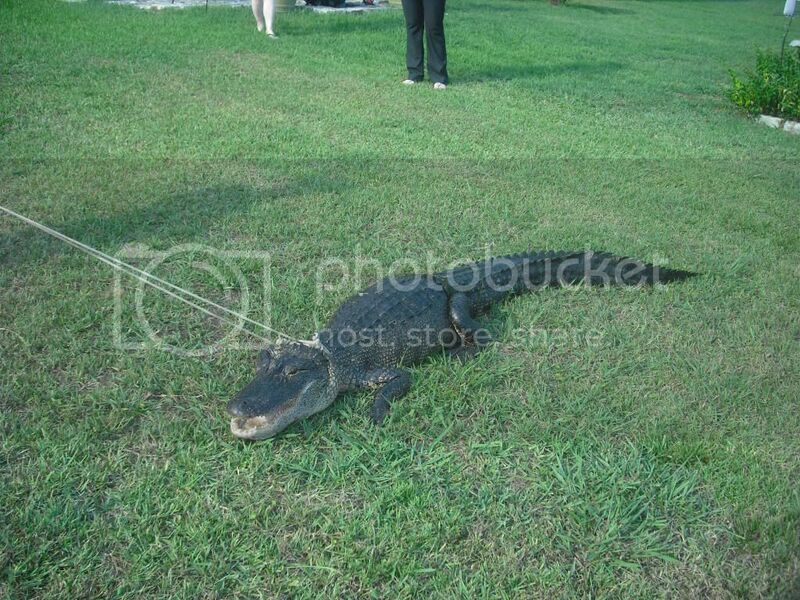 When people hear that we live in Louisiana, they often think of alligators and assume that they are a common sight. In fact, you may have heard of the new television show "Swamp People", which we enjoy watching every now and then (we don't sound like that ya'll). However, even though the swamp is full of these quiet predators that look like a floating log, we haven't seen that many alligators in the swamp. In fact, when we have seen an alligator it has often been on the side of the interstate in New Orleans East (who would have thought) or in a residential area. That's not the place we want to see them! We lived on the bayou in Lacombe, LA for over 13 years and saw a couple during that time, but not too many. However, the bayou behind our house was very "swampy", with muddy water, grass and snakes so we didn't dare swim in it! We now live in a waterfront community in Slidell, LA with a canal behind our house that is much cleaner and a great place to swim or cool off. We've never seen an alligator behind our house (although I always take a look around before jumping in) but evidently they're around! 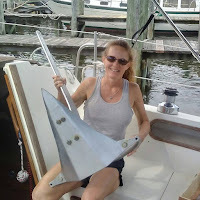 These pictures were taken this past weekend in our neighborhood marina that we were at this past Sunday. We didn't notice this guy, but evidently he was lurking around! 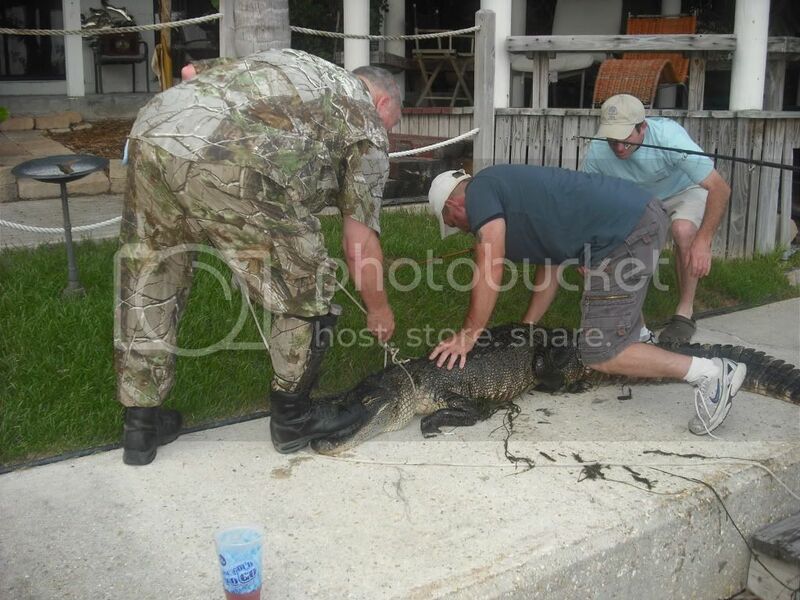 Thankfully the guys of the Wildlife and Fisheries caught the beast and probably put him back in our old stomping grounds of the Honey Island Swamp. 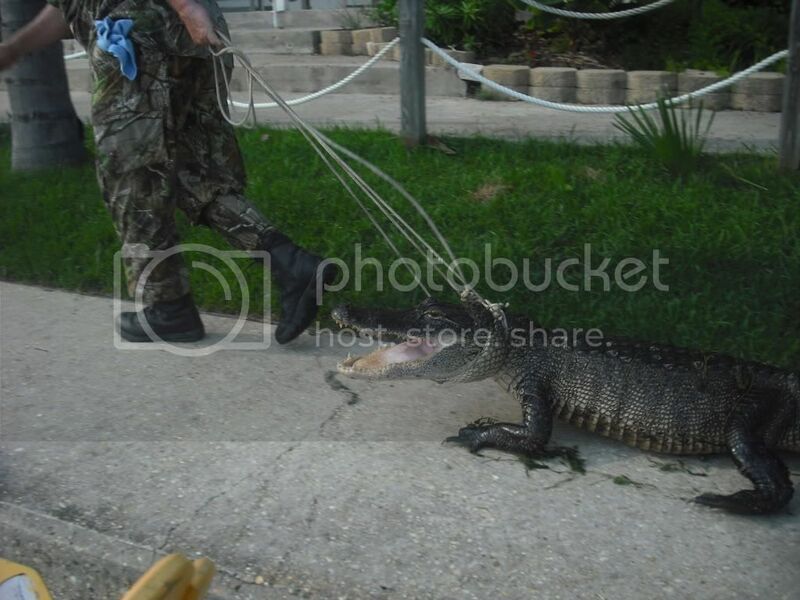 Looks like he's walking the alligator on a leash ... Louisiana's dog! I believe it's illegal to shoot and kill these alligators when seen in a residential area, but boy do they taste good! Alligator sausage, alligator on a stick ... mmm! 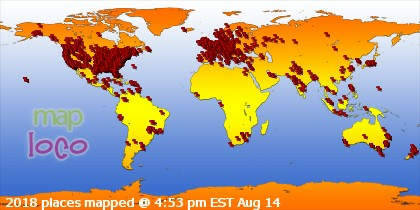 Thinking of the days on the swamp makes me thankful that the internet wasn't really popular back then. Somewhere we're on some tourists' video and pictures from their swamp tour! After a day of partying on a sandbar with friends a tour boat came by. We thought we'd give them something to remember so we all lined up and proceeded to "moon" them. We didn't know how they'd react, but they all started clapping and snapping pictures while the tour boat operator came closer. 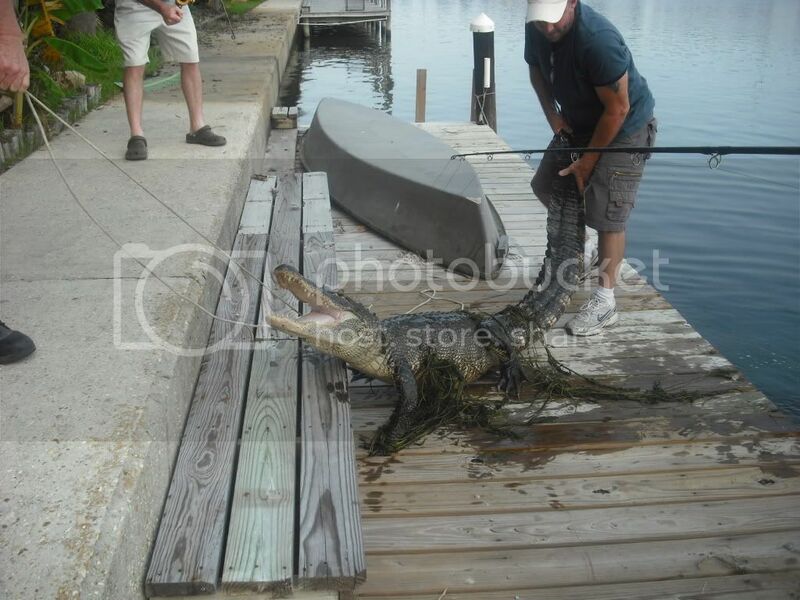 Guess we were the "swamp people" that day ... good times! By the way, the Honey Island Swamp is also home of the Honey Island Swamp Monster. We've never seen him, but we have seen some hairy men out there! Here's a video showing the Honey Island Swamp and the legend of the monster. We actually know the girl interviewed in the video, as well one of the witnesses. So, whether it's watching out for pirates or swamp monsters ... it's always something! Oh that video is scary. Just saying. I don't want to run into any crocodiles either. We see gators fairly often on the St Johns River, I steer way clear of them. Unlike cats and dogs, gators don't like to have their ears twisted. Dani and I have run across a few while canoeing and the other weekend we visited her Mom's boat and there was a 4ft little guy under the docks sunning himself. I mean it was literally like 20 ft from over 4 people and no one had noticed it. It didn't seem to care there were people around. Wild times. 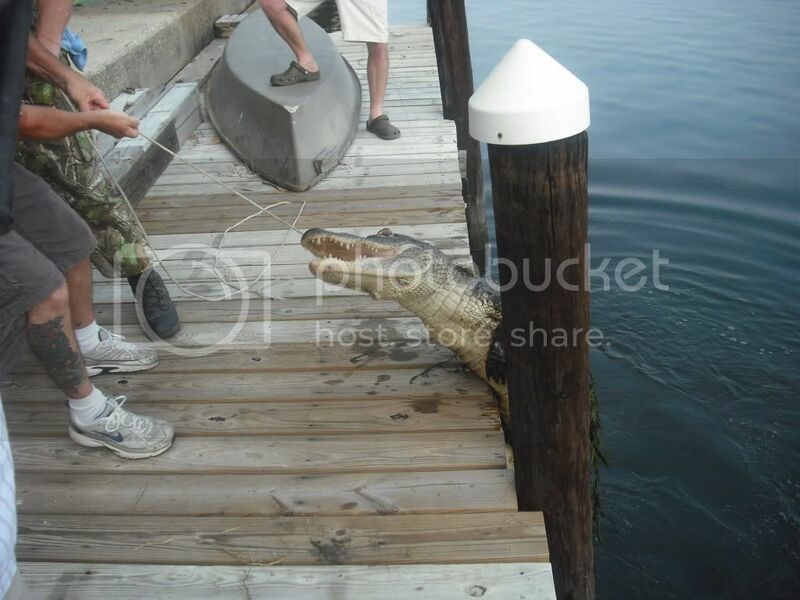 I have to add Crocs to my list of things to be careful of while sailing now? Hmmm... Yeah - I think it still beats dirt dwelling!